MOMMYHOOD: The "Write" Stuff for Test Taking, More proof that the handwritten word should not become a lost art. On the heels of many states making news these days by cutting cursive skills from class curriculum, I came across a short article in a spring issue of Family Circle on how writing before a test can help children calm their jitters and score better. I was intrigued by this, and tore it out as a reminder to perhaps help my daughter this year tackle anxiety in the morning over a big test that day. I also pondered sending this to her homeroom teacher as a possibility for all her students to do better as well. An then it got me thinking about the process of writing in general, and the cathartic benefits it has had throughout my life growing up. And it saddened me a little. 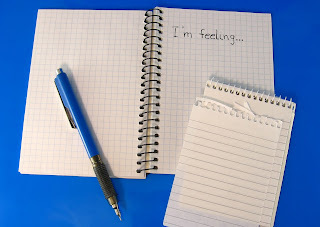 If public schools are starting to phase out handwriting all together in favor of the computer, not only will future generations lose an important skill that helps with motor and brain function, but also the creative and emotional outlet that writing on a piece of blank paper can bring. I remember all through middle school that journal writing was a big part of our English curriculum. In hindsight, it was a brilliant ploy from teachers to keep close tabs on the kids and alert parents to any issues going on with the children. But for a very emotional, hormonal, anxiety-ridden tween, it was a wonderful outlet for me to write my thoughts and feelings down and share them with who I felt was a non-judgmental adult. Mrs. Brown, my teacher, would write silly comments or ask thoughtful questions back on return of our journals. We had to hand it in weekly, and it had to be neat and tidy. This stream of consciousness writing helped to open emotional barriers and creative thinking. This exercise also helped to get us into the habit of writing regularly, and to not be afraid of the "white sheet of paper " staring back at us. Even in my adult years, I have kept a journal off and on to help with my emotional and creative well being. More importantly, I find that in times of emotional distress in my relationships, I write a letter to that person I am having issues with. If my emotions are really running high and I don't feel ready to address that person in a calm way so that our discussion would be productive, I write them a letter that never sees the light of day (OH, how many have I written my husband of 15 years!? LOL! It's probably how we have been able to stay together so long!). Writing gets my emotions and thoughts down and I can be as nonsensical and hot headed as I want. But once it all gets out, I can look at the issue with a clearer head, and I find I can talk things out a lot clearer with that person. Sometimes when emotions get in the way, some irreparable damage is done by things that should not have been said. So it is no wonder that children, worried and stressed about a big test, can get their emotions down and out, and can then focus on the task at hand with a clearer head. The computer will continue to be a bigger part of life, but some things, like handwriting, I believe should still stick around. Even in my full time gig in advertising and marketing, the computer is a major part of what we do. But it is not where we start. What my peers and I do starts with ideas. And ideas are best found with a blank sheet of paper, your brain and a writing utensil. I urge my staff, especially my youngest ones right out of college, that before they touch a mouse in front of a blank screen, they need to think on a piece of paper. The best work has consistently come to fruition that way, and I will preach that until my dying breath. I would love to see the full article as I teach writing in a public school. Is there any way that you can post a link to it or tell me an exact issue? HI Kristy, I saw it in a parenting magazine as a side bar, and they did not site the study, but I found this on a government site that I believe is talking about the same study. Interesting stuff. I am going to point my daughter's homeroom teacher to it. She does not test well right now. Thank you for stopping by! Please come by again! Thanks!